1) ROCKETS (Also known as Crystal) history starts in Paris (France), in the year 1972, when they were known under the name CRYSTAL. 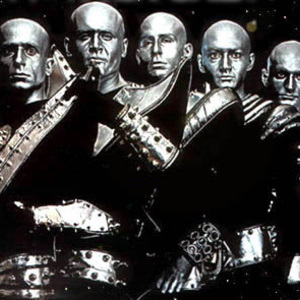 In 1974, they changed their name to ROCKET MEN (or ROCKETTERS) as five aliens, bald, with grey eyes, silver skin and space suits, recording the single 'Rocket Man' produced by Claude Lemoine, who would become their producer 'til 1983. In 1975, they changed their name in ROCKETS and recorded a single 'Future woman'. In 1976, their first LP entitled, 'Rockets' was released in France, and the group launched a series of phantasmagoric live shows which involved vocoder, lasers, coloured lights, smoke and a bazooka fighting flames three . Their following LP 'On the road again' (1978), is released in a large number of countries. In the following years they released two masterpieces of "space-rock": Plasteroid (1979) and Galaxy (1980). After two more LP (P 3,14 in 1981 and Atomic in 1982) they changed their look (no more silver painted aliens), formations and music style, and the following albums weren't so successful. In 2000 Fabrice Quagliotti (keyboards) brought back the band name, with all new members. In 2003 came out a new CD (Don't Stop) with some new songs in the "classic rockets style" (Rocketsland, Communication) and other dance remixes not so appreciated by most of their fans. Now the band is still alive and a new work is forthcoming. 2) Rockets (UK Alternative Band), a side project or former full time band for solo Artist Roberto Cappellina, consisting of members of the fomer band FarFromWords who played rock music around Watford town between the years of 2001 and 2004. Although their single one EP titled Rockets EP released in 2006 is a little hard to find, by contacting the lead singer you can access such music. Short lived but not forgotten. 3) ROCKETS (from 07 to present) is a french-touch inspired house project out of San Francisco and Portugal. A member of Discotexas, a label and collective known for an unabashed love of fun and fruit (not necessarily by this order), he's known for producing tracks that range from the likes of filtered disco house to italo-disco and electronica. He is frequently playlisted by the likes of A-Trak, Armand Van Helden, Treasure Fingers, Gloves, Patrick Alavi among other djs and producers from both old and new music scenes. ROCKETS has shared the dj booth with artists like Alan Braxe, In Flagranti and A-Trak, and often tag-teams with Xinobi and Moulinex (also out of Discotexas) to lighten up summer festivals and club floors. The first official release from Rockets is coming out of Discotexas in December 2009, and other releases are lined up on different labels. 4) The Rockets (Detroit Band) were a Detroit, Michigan rock band formed in 1972 by former Mitch Ryder and The Detroit Wheels members Johnny "Bee" Bandajek and Jim McCarty. Vocals and drums were handled by Bandajek, McCarty was on lead guitar, John Fraga was on bass and Marc Marcano was on keyboards. Johnny Bee was the driving force and primary songwriter for the Rockets. In the early days, The Rockets paid their dues playing gigs at venues such as, The Rainbow Room and The Peoples Ballroom in Detroit, and The Rock 'N Roll Farm in Wayne, Michigan. The band took on a new sound in 1976 when David Gilbert was brought in to take over vocals from Johnny Bee. Gilbert had fronted several garage bands and had a brief stint singing for Ted Nugent and The Amboy Dukes in 1971. His drinking and drug habits didn't set too well with the Motor City Madman. Gilbert's raw vocal power proved to be just the ticket to complete the Rockets sound. However, as Nugent had before them, Bandajek and McCarty quickly realized Gilbert would be trouble for the band with his frequent drug and booze binges. The friction between them would go on for seven years before it eventually tore the band apart. The Rockets performed for their last two shows at Pine Knob (now known as DTE Energy Music Theatre) near Detroit on August 28th & 29th, 1983. The band splintered and the members all went their separate ways. Bandajek, McCarty and the rest went on to other projects. Gilbert played in a couple of short-lived local bands and ended up taking a job hanging drywall. David Gilbert was 49 when he died of cirrhosis in 2001.